A local species widely distributed in the southeast with many modern (post 1990) records below a line from the wash to southeast Dorset including the Isle of Wight. Beyond these there are a few scattered and isolated modern records from Somerset, Cheshire, Wrekin and, from Scotland, south Lanark. Typical habitat is ponds and ditches with plenty of vegetation, often in wooded areas (Nilsson and Holmen) and this describes very very well the site of our record of the species during June 2009 when five males were swept from a very shallow weed choked pond shaded by dense broadleaved woodland near Denham (Middx). Although we have not recorded the species from Watford it seems sensible to expect it as there are modern records from southeast Herts on the NBN (Jul 09). Balfour-Browne records first, second and third instar larvae in early August and newly emerged adults in August and September suggesting overwintering by both adults and larvae; Nilsson and Holmen state that adults overwinter on land and return to breeding sites in the spring. Oviposition may therefore be extended, beginning early with matured overwintered adults and continuing later as adults from overwintered larvae mature later in the year. The large size and distinctive colouration will identify this species. 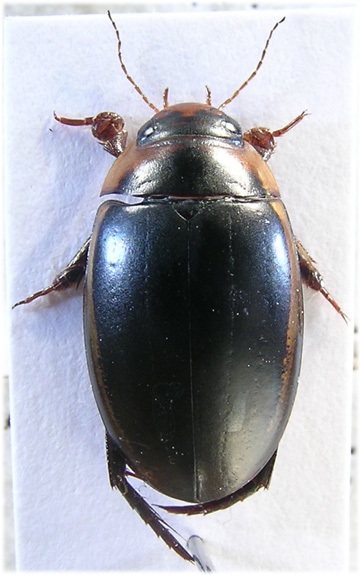 Three species ofHydaticus Leach, 1817 are includedin the British list (Foster, G.N. in Duff); seminiger (De Geer, 1774), transversalis (Pontoppidan, 1763) and continentalis Balfour-Browne, J. 1944 (=stagnalis (Fabricius, 1787) non (Fourcroy, 1785)). H.seminiger is featured, transversalis is a much less frequent species occuring in the south. All are easily recognised; large insects, 12-14mm with a dark transverse mark across the base of the pronotum. H.seminiger is described above, in transversalis the dark pronotal mark is shorter, extending only about halfway to the front margin and there is a transverse yellow mark behind the base of each elytron. Hyadaticus continentalis is now probably extinct in Britain (Friday), here the dark pronotal mark is short, less than half the pronotal length and often narrower so that the yellow lateral border is very broad at the base. The elytra have various longitudinal yellow marks but lack the basal transverse marks of transversalis. Our three listed species are keyed in some detail by Nilsson and Holmen, 1995.